Burmese support Lankan initiative to spread Buddhism in Germany: This photograph was taken at a public meeting held in Colombo in 1954 to raise funds for the Buddhist mission to Germany. Burmese Ambassador U Ba Lwin and Ven. U. Seelananda Thera are here. The forthcoming visit of Myanmar’s Head of State and Chairman of the State Peace and Development Council, Senior General Than Shwe, marks another milestone in the historical relations between Sri Lanka and Myanmar. This will be the first visit of a Burmese Head of State here since the visit of General Ne Win in December 1962 to take part in a meeting of leaders of several Non - Aligned countries to bring about a peaceful solution to the Sino-Indian conflict that broke out the same year over a border dispute. Prime Minister Sirima Bandaranaike hosted the Conference that later became known as the ‘Colombo Summit’. President Mahinda Rajapaksa’s visit to the Union of Myanmar in June this year and General Than Shwe’s return visit will no doubt send a strong message to a handful of countries that are disillusioned with both nations for projecting a degree of assertiveness internationally as free independent sovereign nations. The two countries enjoy a special relationship on several grounds. The foremost among them is the Theravada Buddhist connection that goes back to nearly 10 centuries. Both are heirs to a proud history and high achieving Buddhist civilization. Both countries were subject to European colonial rule. Myanmar was more fortunate than Sri Lanka in the sense that the former suffered less than 100 years of Western colonialism. Consequently, the vast majority of Burmese were never uprooted from their Buddhist heritage, customs and traditions. Since 1948 both civil and military Governments of Myanmar have supported Theravada Buddhism. Both countries regained independence from British rule in the same year -1948. The following year (June 7, 1949) they established diplomatic ties. It was September 4, 1945. The place, South-Asia Command (SEAC) Headquarters in Kandy, Sri Lanka. A military delegation from Burma had arrived in the Hill Capital to conclude an agreement with the Allied Supreme Commander SEAC, Admiral Lord Louis Mountbatten. The Agreement was on the disbandment of the Burmese Patriotic Forces and their reorganization as a standing Myanmar Army. The Patriotic Forces had fought the British and subsequently the Japanese in World War II. Leading the delegation was General Aung San who was expected to be free Burma’s first Prime Minister after having devoted his life to the anti-colonial struggle. He and his men had fought the Japanese on condition that the British met their demands for full independence. The delegation also included General Ne Win (then a young major) who later became Head-of State of Myanmar. The Kandy Agreement which General Aung San had signed meant that the British would soon be compelled to give up Myanmar, a country which had strong religious and cultural ties with Sri Lanka. Hence, the choice of Kandy as the venue had a historic significance. Both countries were moving fast towards democratic self-rule to the delight of all freedom-loving peoples. This was the first visit of a Burmese Prime Minister to Sri Lanka after the grant of independence to Burma in January 1948 by the British. U Nu succeeded Aung San as Prime Minister after the latter and most members of his future Cabinet were brutally assassinated while presiding at a meeting of the Governor’s Executive Council in Rangoon on July 19, 1947. U Nu’s delegation to Colombo included U. Thwin, Trustee of the world famous Shwe Dagon Pagoda in Rangoon. They visited Sri Lanka to attend the Colombo Plan Conference in Colombo in January 1950. They made many new friends in Sri Lanka. On the eve of their departure (February 2, 1950) to Burma, U Nu and U Thwin visited P.J. Weeraratna and Sons, a leading business establishment reputed for jewellery and wrist watches, based in Maradana, Colombo. On this visit U Nu met Asoka Weeraratna, a partner of this firm, who was later instrumental in the spread of Buddhism in Germany through organizing Buddhist missions comprising monks from Sri Lanka and in establishing the Berlin Vihara (Das Buddhistische Haus founded by Dr. Paul Dahlke) with resident monks drawn primarily from Theravada Buddhist countries on a permanent footing. The Sixth Buddhist Council was held in Rangoon in 1954. It was sponsored by the Burmese Government under Prime Minister U Nu, who had previously authorized the construction of the Maha Pasana Guha Cave, a great artificial cave built from the ground up and completed in 1952, to serve as the gathering place, much like India’s Rajgiri’s Sattaparni Cave that had housed the First Council immediately after the passing away of the Buddha. This new “cave” measured 220’ by 140’ inside and could seat 10,000 people. The Sixth Council opened on May 17, 1954. Like the preceding councils, its chief objective was to recite, affirm and preserve the genuine wording of the Vinaya, Suttas and Abhidhamma -the ‘pariyatti’ —as related by the Buddha and his principal disciples. This Council was unique in that the 2,500 learned Theravada monks who participated came from eight countries—Myanmar, Sri Lanka, Thailand, Cambodia, Laos, Vietnam, India and Nepal—unlike previous councils which had included monks from the host countries only. Mahayana monks and representatives from all Buddhist countries also attended. The Sri Lankan delegation to the Council comprised about 40 members, including Kumara Semage, president of the Sri Lanka - Myanmar Friendship Society. Ven. Nyanatiloka and Ven. Nyanaponika, two German monks, then residing in Sri Lanka, also figured prominently in this Sixth Buddhist Council. The complete traditional recitation of the Theravada Canon at this Council took two years, from 1954 to 1956. The Pali Tripitaka and its allied literature in all the diverse national scripts were painstakingly examined, their differences noted, necessary corrections made, and all the versions collated. By the time the Council was over, all the participating countries had the Tripitaka rendered into their native scripts, with the exception of India. The Council closed on the full moon of May 1956, exactly two and a half millennia after the Buddha attained Parinibbana. The version of the Tripitaka which the Sixth Buddhist Council produced is recognized as being true to the pristine teachings of Gautama Buddha and the most authoritative rendering of them to date. Ven. Sayadaw U. Silananda is an icon in Myanmar for his invaluable contributions to Buddhism in setting up Buddhist Temples in the west coast of USA. He was one of the Burmese monks who arrived in Sri Lanka in the early 1950s. He was closely associated with the work of the Sri Lanka based German Dharmaduta Society in the initial period in its mission to propagate Buddhism in Germany and other western countries, while being based in Sri Lanka from 1954 - 1956. Ven. U Seelananda accompanied a delegation of the Society to visit Burma in December 1955 to garner support and funds for the propagation of Theravada Buddhism in Germany. 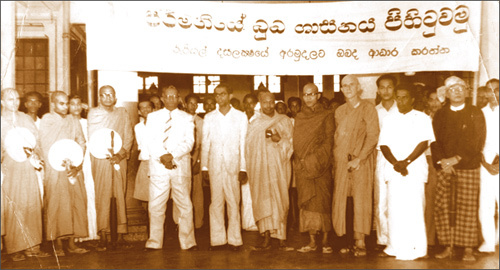 The GDS-sponsored delegation from Sri Lanka to Burma in 1955 comprised Ven.U Seelananda, Ven. Nyanaponika (German monk), Ven. Galle Anuruddha, Nelson Soysa and Asoka Weeraratna (Founder and German Dharmaduta Society Secretary). Ven.U Seelananda later became the Rector of the International Theravada Buddhist Missionary University in Yangon, Myanmar. Ven. U. Silananda, was the Spiritual Advisor of the Theravada Buddhist Society of America, which has a large centre in Half Moon Bay, California. He was also the Spiritual Director of Centres in Berkeley and San Jose in California, and in Florida. He taught in both English and Burmese. He passed away on August 13, 2005, in USA following a brain tumor. He was 78. The German Dharmaduta Society, established in 1952, sought funds and the support of other Theravada Buddhist countries for the noble project to spread the Dhamma in Europe. Burmese Prime Minister U Nu supported the work of the Society in a message addressed to the GDS (1954) stating that every effort made towards increased propagation of the Dhamma in Germany deserved all possible support and encouragement. He further said he was glad to note Germany was not the only country in the West that the Society had in mind to propagate the Dhamma. Burmese and Nepalese living in Sri Lanka attended public meetings of the Society. U Ba-Lwin, the then Ambassador from Burma in Sri Lanka (1954 - 1956) enthusiastically addressed several public meetings of the Society held in various parts of this country. Ven. Mahasi Sayadaw (1904-1982) was a famous Burmese monk and meditation master who had a significant impact on the teaching of Vipassana (Insight) meditation in the West and throughout Asia. In his style of practice, the person meditating anchors the attention with the sensations of the rising and falling of the abdomen during breathing, observing carefully any other sensations or thoughts that call the attention. Ven. 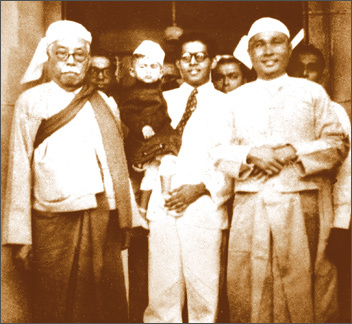 Mahasi Sayadaw was a questioner and final editor at the Sixth Buddhist Council held in 1954. He helped establish meditation centres all over Myanmar as well as in Sri Lanka, Indonesia and Thailand and by 1972 the centres under his guidance had trained more than 700,000 people in meditation. He died in August 1982. Several Sri Lankan meditation Centres have adopted the techniques taught by Ven. Mahasi Sayadaw in the teaching and practice of Vipassana Meditation. Today there is an increased understanding between Sri Lanka and Myanmar in resolving issues through a common approach. Recently the Myanmar Government donated US $ 50,000 for the welfare of the IDPs in the North. It also presented a tusker to Sri Lanka for Buddhist ceremonies, as a gesture of friendship. There is a visible number of Buddhist monks from Myanmar engaged in post-graduate studies on Pali and Buddhism in Sri Lanka. The close links between the two nations must continue into the future and lay the foundation for an international summit conference of predominantly Buddhist countries. It is an event long overdue. Sri Lanka and Myanmar may well consider jointly sponsoring such an international conference.